Have you considered shopping around for the best value on a region-free blu ray player? While you might find plenty of discount electronic stores online, you won't find many with as many affordable prices as you can here at Bombay Electronics. Along with our superior reputation with the Better Business Bureau and Google, you can shop here in confidence. But that's made even better with the knowledge you'll be able to obtain Blu-ray player names you can trust. LG has become one of the leading companies now of HDTV's and Blu-ray players. And with some people wanting to seek out DVD's or Blu-ray discs from other countries, a region-free player might be either hard to find or too expensive. Fortunately, we offer LG region-free players in different versions that will surprise you in price. 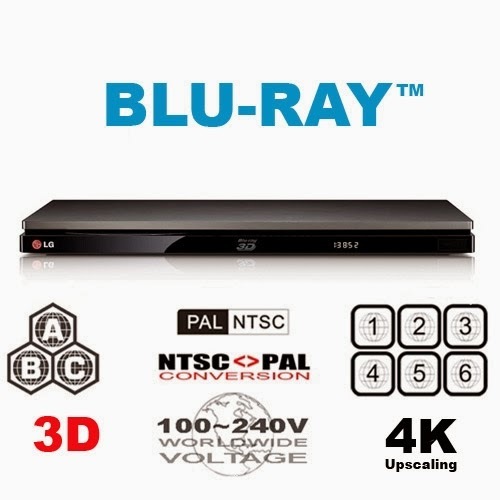 Here you have a basic but quality Blu-ray player that's guaranteed to play any region code from PAL to NTSC. It also plays all three international Blu-ray regions on any type of TV, including analog if you still have one. With Smart TV applications and built-in Wi-fi, you get some amazing features for the price. You also have 1080p upscaling for all your standard-def DVD's. The surround sound is impressive and gives you everything you need for the best possible theatrical experience in your home. We've given this a world class modification, and any updates to the player work easily with LG's firmware updates. This model doesn't add a considerable amount to the price to have a basic 3D player that plays any 3D Blu-ray disc. While also playing any region disc from around the world, the 3D quality is notable because of its quality. You shouldn't expect anything less from LG based on their reputation. On this player, you get a bright 3D picture with no motion blur. Plus, you have brilliant 3D sound to complement it all. This is the most state-of-the-art region-free Blu-ray player available by LG and conforms to those getting into the 4K TV trend. Even if 4K TV's are very expensive now, you can still use this on standard 1080p TV's as well as any TV. That's the real beauty of LG in their ability to let you do so much with little restrictions. Along with 3D features and the region-free features on the above models, LG's Resolution Upscaler lets you enjoy the 4K quality with Blu-ray discs. This way, you can enjoy 4K clarity on your movies long before being able to see similar broadcasts on TV. We have a considerable price reduction on this model you should strongly consider if you care anything about the clarity of your movies. Contact us if you have any questions or comments about our LG Blu-ray players. Once you try an LG, you'll realize you made the right choice. However, if you need any technical support, we're here to help guide you through so you can enjoy your region-free movies without hassle. It's really amazing when you have a facility for electronic stores online. To get that fun, Please visit our site.